When Calla Tor wakes up in the lair of the Searchers, her sworn enemies, she’s certain her days are numbered. But then the Searchers make her an offer, one that gives her the chance to destroy her former masters and save the pack and the man she left behind. Is Ren worth the price of her freedom? And will Shay stand by her side no matter what? Now in control of her own destiny, Calla must decide which battles are worth fighting and how many trials true love can endure and still survive. Writing like Andrea Cremer’s almost makes me forget that I’m reading a YA book, it’s so well written. Not to say that YA writing isn’t on par with adult books, because it is, it’s just Andrea writes very well. Which also makes it so I feel like there’s a movie going on in my mind while I’m reading, which I love because then I feel like I’m there with the characters, instead of just reading about them. 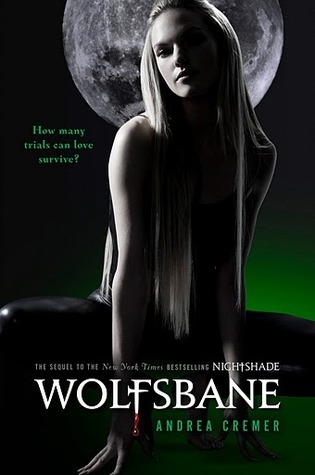 Wolfsbane picks up exactly where Nightshade left off. The pacing is excellent and was kept moving throughout the entire story, with twists and turns that were unexpected. And some bombs were definitely dropped, especially near the end. We learn something about a major character we thought we knew, and I for one was not expecting it. The love triangle isn’t quite as present as it was in Nightshade, since Ren is mostly only talked about but not seen very much. Which really is a shame, because I am firmly Team Ren. I have to say Calla’s indecision about who she really wants didn’t bother me as much as it usually might, and I can only say it’s because I have seen some merit in Shay, though he still bugs me. 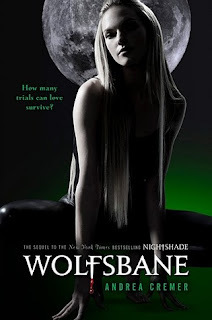 We meet a new set of characters in Wolfsbane, the Searchers. I have to say they made me enjoy this book much more than Nightshade, especially Connor with his humor. Adne is also one of my favorites, and is involved in the bomb that is dropped about another character. I’m really excited to see where it is taken in Bloodrose, as well as her mysterious relationship with Connor. I disliked Ethan from the get go, but then did a complete 180, just like he did about the Guardians. Watching them all interact with each other, they felt like real people who’ve been together for a long time. Over the last few years, after reading many werewolf and vampire books I got pretty tired of them, and stayed away of paranormal books for quite a while. This however is not your average paranormal story, so even if you’re not a huge fan of werewolves, I would still say give this a try. Andrea Cremer’s story packs punches left and right that leave you wanting so much more, and she always delivers. This series is a definite must read series.